This inverted ‘U’ shape is a portion of a divider between parking spaces at my second most frequented parking lot. I like this kind of spacer better than the single lines that delineate spaces for cars. Being outside the limits of this double-lined spacer is assurance that one is parked correctly. One cannot be sure with the single-line-defined spaces. With nonstandard parking space widths, a comfortable space between the driver’s door and the line does not always translate to equal space on the other side of the vehicle. Even at night, I am comfortable with this parking space divider. 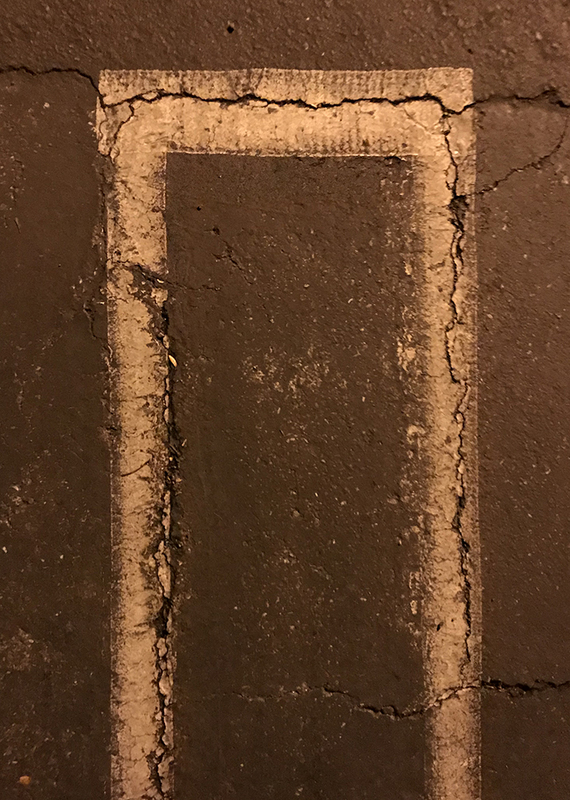 This entry was posted in Personal Stories and tagged abstract art, abstract photography, art, creativity, double lines, night photography, parking lot, photography, street photography, visual arts. Bookmark the permalink. Thanks Phppi. It is a challenge to square everything with a phone camera (in the dark). Thanks K! Lighting is the magician. I like the brown/yellow tones here. And, I totally agree about this parking line vs the single. I am poor at parking and I welcome the extra room. Thanks Claudia. This is the best parking lot for lighting. I love those double spacers two! !